Where does the accountability for our employee’s wellbeing lie? What is our risk exposure? How can we optimise wellbeing for our people without losing sight of what we have to achieve? 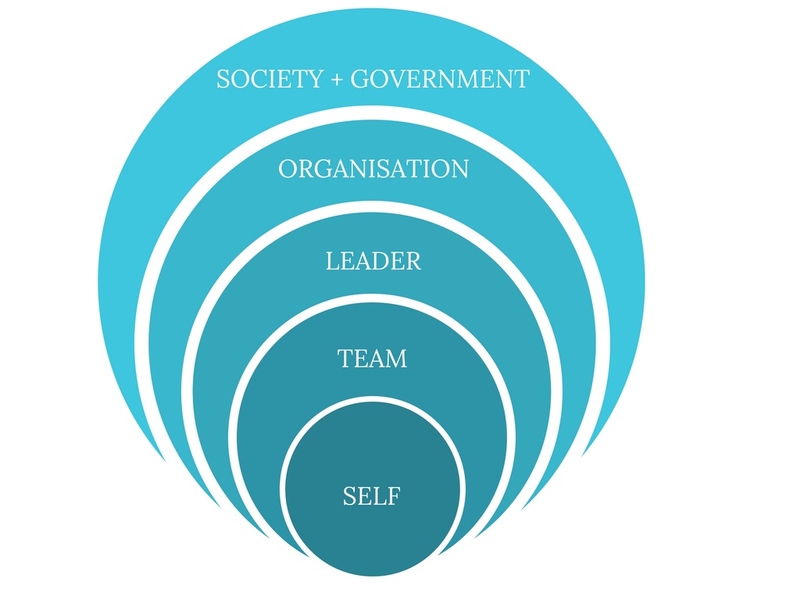 Our firm belief is that wellbeing should be addressed at various levels, as the illustration suggests but there’s a reason why the ‘Self’ circle is front and centre. For most of us (those who have access to food and shelter) wellbeing is fundamentally a personal and subjective experience – a ‘state of being’ that is influenced by our unique circumstances, challenges and resources (and probably a heavy dose of our genetic make-up too). Because of this, no one can ‘give us’ wellbeing and our wellbeing is unlikely to be perfected by interventions provided by our organisations unless they meet our very specific needs at the right point in time! Complex isn’t it?! Each of us has to shoulder the responsibility for our wellbeing – we make the decisions about how we spend the precious 168 hours in a week, even if it doesn’t always feel that way. We decide what to consume, how and when to move, who to connect with, when to sleep and how often to check our devices ☺ (A wellbeing tip: work back from 168 hours and account for how you spend it now and how you might like to spend it…time is a finite resource, apply wisdom to how you use it). So, our perspective is that individually we have the biggest impact on our wellbeing. Yet, there are other people and systems that create the conditions for us to thrive and flourish, or not – and in the work context, this is especially our colleagues, our people leader, our organisation and government & society as a whole. Continual access to and excessive time spent on devices can interfere with our sleep, lead to anxiety disorders (FOMO, Nomophobia , get it? ), affect our relationships, increase our working hours, decrease our resting time, increase our social isolation – all negative impacts on our wellbeing. Of course, our device/technology time is often directly linked to the demands of our work – there are few roles these days that don’t demand connectivity for a significant chunk of the working day. But who is responsible and importantly, who can positively influence our habits in relation to this? Self – once again, we make the decisions about our behaviour – we choose to check emails, or access social media. No one forces us to do this. We can also make the decision to limit how often and when we are going to do this and when we are not. Those readers with children – you can’t complain about your kids’ excessive screen time when they are following your lead! Team – how many of your work emails are really necessary? Can your team agree a protocol about the use of email, and the expectation of responding outside of ‘work hours’? An open discussion about the importance of ‘unplugging’ and some good humoured behavioural targets across a team can work wonders to change behaviour. Leader – leaders set the tone for their teams and what they do will be followed. So as leaders, are you subtly encouraging your people to be accessing emails out of hours? Do you have a reasonable and shared expectation about responsiveness? Are workload demands resulting in a requirement for unsustainably long working hours for your team? Organisation – leaders will be guided by organisational policy, culture and senior leadership – so role model what matters and seek ways to discourage excessive technology time. For example, Volkswagen in Germany is one of several companies to limit emails being sent ‘after hours’. What would it take for Australian organisations to try a similar approach? Are there companies out there leading the charge on this? Society/Government – France enacted a law in 2016 establishing workers ‘right to disconnect’. Companies with more than 50 employees had to set hours when staff should not send or respond to emails. Can we as a society start to set limits on when it’s appropriate or not to be accessing devices? (e.g. it works at the cinema & theatre, what about extending this to restaurant meals and concerts?). So, who is responsible for wellbeing? We are. For ourselves first and foremost and then as contributors to creating the conditions for wellbeing for others around us. Is your mobile phone addiction affecting your mental health and wellbeing? Impact of devices on human wellbeing: user beware! GLWS is a Supporting Partner of The Thriving Workplace Event in August. Are you planning on coming along, but haven’t booked your ticket yet? We now only have 40 tickets left, so get in quick!